In the world of clinical research, Alzheimer’s disease (AD) studies stand out due to their requirement of study partners: often a spouse, child, or close friend who provides support for the patient undergoing memory testing, MRI brain scans, and trial drug infusions. But the importance of study partners also extends to the preclinical setting. As researchers start to study and identify individuals at high risk of developing Alzheimer’s disease with genes and biomarkers, study partners can help reduce participants’ anxiety and distress, report to researchers how participants are doing, and ensure findings of these studies have practical applications. This is why Penn Memory Center Co-Director Jason Karlawish, MD, and University of California, Irvine Professor Joshua Grill, PhD, argue that study partners should be required in all preclinical Alzheimer’s disease studies. Their review article was published in Alzheimer’s Research and Therapy. In Alzheimer’s disease dementia clinical trials, study partners are often already caregivers. 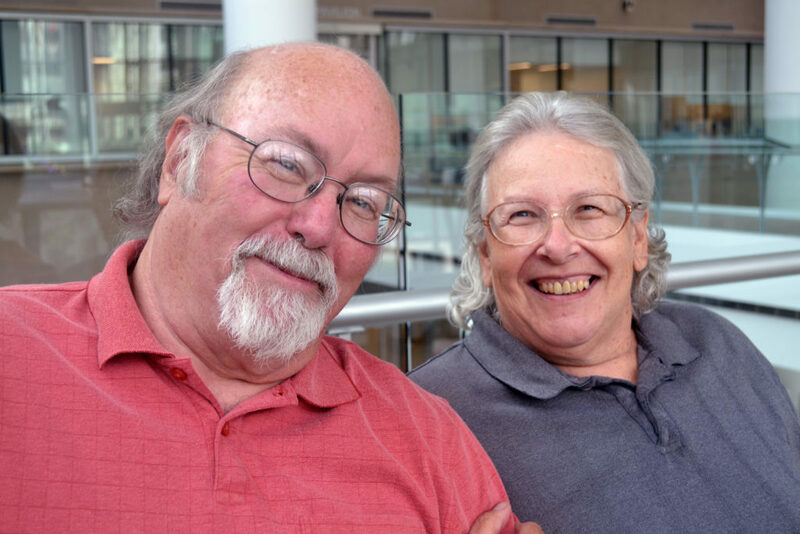 John Witzman both cared for his wife, Jacqueline Witzman, and joined her in completing studies at the Penn Memory Center. He accompanied her to study visits, gave informed consent, explained to researchers how she was doing, and helped motivate participation in the study. His story was featured on Making Sense of Alzheimer’s. But in preclinical Alzheimer’s disease trials where participants are functionally independent and able to make their own decisions, it might be harder to see why study partners are necessary. Drs. Karlawish and Grill outline these reasons. First, clinical trials often require disclosing potentially distressing information to participants, such as the presence of an ApoE genetic marker or the result of an amyloid PET scan showing ‘elevated’ amyloid. Both are associated with increased risk of developing Alzheimer’s disease. Learning this information can have a significant, sometimes unexpected, psychological and emotional impact. But having a study partner can help ease this distress. For example, sharing information with others about your biomarker and gene results is associated with decreased anxiety and depression in participants. Furthermore, these trials often draw on study partners to provide feedback on participants’ cognitive performance. Using a combination of participant and study partner reports, instead of just participant reports alone, provides more accurate data for studies. Participants with study partners are also less likely to drop out of studies, due to the support study partners provide. Finally, trials often help inform new ways to approach the field of Alzheimer’s disease. Not only does information from study partners help evaluate how well trial therapies are actually working, this information can also contribute to public health work: for example, when the onset of dementia is, or how large the economic burdens of dementia are. Including study partners in these trials can also mean including them into conversations of future planning, such as healthcare decisions and retirement plans. This is important to further reduce the risk of cognitive decline in study participants and prepare both them and their partners for the onset of cognitive symptoms. (4) help study partners prepare to become caregivers. The newly emerging field of preclinical Alzheimer’s disease trials is “ethically complex and unique,” according to Drs. Karlawish and Grill, but will help inform new methods of treatment and diagnosis of Alzheimer’s disease. While there might be costs to requiring a study partner in these trials, these costs are outweighed by the benefits of having a study partner. This article was published in Alzheimer’s Research and Therapy on December 6, 2017.